Leslie Odom Jr. (born August 6, 1981) is an American actor and singer. He has performed on Broadway and in television and film, as well as in other theatrical productions. He is perhaps best known for his performances as Sam Strickland in the 2013 musical television series Smash, as well as in the role of Aaron Burr in the musical Hamilton, a performance for which he won the 2016 Tony Award for Best Actor in a Musical. Odom was born in Queens, New York. Later, his family moved to the East Oak Lane section Philadelphia where he grew up. He attended Julia R. Masterman School for middle school and high school. After graduating, he attended Carnegie Mellon University in Pittsburgh, Pennsylvania, graduating with honors. After he graduated, he moved to Los Angeles in the summer of 2003. After starring in Venice Off-Broadway and Witness Uganda at A.R.T. and in workshops, Odom Jr. worked with Lin-Manuel Miranda in the Encores! Off-Center production of Tick, Tick... Boom! playing Michael. Odom also played Nat King Cole in the 2015 one-night Actors Fund of America benefit concert of Bombshell. Upon questioning if Odom would play the role when the show eventually opens on Broadway, it was implied that the part will be cut from the show. 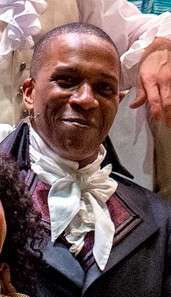 Odom was nominated for a 2015 Drama Desk Award for Outstanding Featured Actor in a Musical for the role of Aaron Burr in the Off-Broadway production of Hamilton at The Public Theater. He continued in the same role at the Richard Rodgers Theatre after the show transferred to Broadway later that year where it continues to run to massive acclaim. He also won a 2016 Grammy Award for the cast album, and won the Tony Award for Best Actor in a Musical. In 2003, Odom began a recurring role as Joseph Kayle on CSI: Miami, appearing on nine episodes between then and 2006, when he left to take a recurring role as Maliko Christo on Vanished, appearing in 10 episodes before the shows' cancellation. From 2006 to 2007, he held a recurring role as Freddy on Big Day, appearing on nine episodes prior to its cancellation. He later had a supporting role as Julian Noble in the TV movie Poe in 2011. In 2012 he had a recurring role as Sam Strickland on Smash, before being promoted to a starring role for season two in 2013 before the series was cancelled. His performance was praised, though the show's second season was not. In late 2013, he was offered the leading role of Lucas Newsome on State of Affairs. He accepted the role, but ended up backing out to take the part of Aaron Burr in the workshops of the musical Hamilton. From 2013 to 2014 he had a recurring role as Peter Collier on Person of Interest, appearing on a total of eight episodes. He also played Reverend Curtis Scott on 7 episodes of Law & Order: Special Victims Unit between 2013 and 2015. Beginning on May 19, 2016, Odom Jr hosted the Broadway.com web series Aaron Burr, Sir: Backstage at Hamilton with Leslie Odom Jr, with a new episode being uploaded every Thursday for 8 weeks. Odom was also set to play Jimmy Jam in a 2017 miniseries about New Edition, but ended up leaving the project. He has made guest appearances on several shows including Gilmore Girls, Grey's Anatomy, and The Good Wife. Odom Jr. has appeared in multiple short films, and had a supporting role as Declan Hall in the 2012 war film Red Tails. He will play Dr. Arbuthnot in Kenneth Branagh's upcoming adaptation of Murder on the Orient Express. He released his debut album Leslie Odom Jr. in 2014 on CD and Soundcloud. He promoted the album with several concerts at the Public Theater, and in 2016 he released a version of Selena Gomez's Good For You. Also, in June 2016 he released an updated and improved version of Leslie Odom Jr on S-Curve Records. The album charted at #1 on Billboard Jazz and #147 on Billboard 200. He promoted the album with a series of concerts throughout the year. On November 11, 2016, he released a new album, titled Simply Christmas. 2014 Tick, Tick... Boom! Michael Encores! 2008 Grey's Anatomy P.J. Wallings Episode: "There's No "I" In Team"
2015 Gotham Ian Hargrove Episode: "Harvey Dent"
Odom met Nicolette Robinson when he was an assistant director to Billy Porter for Once on This Island in Los Angeles, in 2008. Robinson, then a student at UCLA, had auditioned for the show, but was not initially cast. Later, she joined as a replacement when another cast member went on leave. Odom was responsible for "put in" her rehearsals for the show. They were subsequently married on December 1, 2012. On October 17, 2016, it was announced that they are expecting their first child. 1 2 The Broadway League. "Leslie Odom Jr. - IBDB: The official source for Broadway Information". ibdb.com. ↑ "Bombshell Benefit Concert Raises More Than $800,000 for The Actors Fund". Actors Fund. Retrieved 28 October 2016. ↑ Paulson, Michael (June 19, 2016). "Leslie Odom Jr. to Leave 'Hamilton' on July 9". The New York Times. Retrieved June 20, 2016. ↑ Fleming, Jr., Mike (September 29, 2016). "Johnny Depp To Star in 'Murder On The Orient Express' At Fox'". Deadline. Retrieved September 29, 2016. ↑ "Peter Collier (Character)". IMDb. ↑ Juneau, Jen (October 17, 2016). "Broadway Baby! Leslie Odom Jr and Nicolette Robinson Expecting First Child". People.com. Retrieved October 17, 2016.